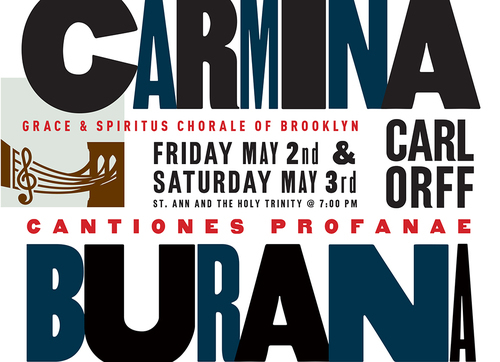 Grace & Spiritus Chorale of Brooklyn will present two performances of Carl Orff’s Carmina Burana, a cantata composed in 1935-36, based on medieval poems, that has become one of the world’s most recognized pieces of “classical” music, and has been covered by, among many others, the Swedish metal group Therion and by Nas and Puff Daddy in “Hate Me Now”. Performances are at St. Ann & the Holy Trinity Church, corner of Clinton and Montague streets, starting at 7:00 p.m. on Friday, May 2 and Saturday, May 3. Tickets are $15 ($12 for students or seniors) and may be purchased through the Grace & Spiritus website. On Saturday at 6:00 p.m.and Sunday at noon, Professor Sanford “Sandy” Ikeda, of SUNY Purchase, will lead “Jane’s Walk” tours of Brooklyn Heights. These walking tours are inspired by the work of Jane Jacobs, whose book The Death and Life of Great American Cities challlenged the urban planning ortodoxy that would have, for example, approved Robert Moses’ original plan to run the BQE through the heart of Brooklyn Heights. Prof. Ikeda “teach[es] a course in which Jane Jacobs’s concepts are central. Like that course, the Walk focuses on the relation between the design of public space and social interaction and economic development.” The walks, which last about two hours, are free; meet at the Borough Hall steps at the appointed time. More information is here. On Saturday and Sunday mornings, starting at 9:00, there will be Jane’s Walks providing sneak previews of Brooklyn Bridge Park’s soon to open Pier 2 and Pier 4 Beach. These are also free, but all participants will be required to sign release forms, so you are asked to be at the walk’s start point, the Brooklyn Bridge Park offices at 334 Furman Street (corner of Joralemon) by 8:50 a.m. There’s more information here. There is also a free docent tour of Pier 1 on sunday starting at noon; more information here. Again, Smorgasburg will be on the Pier 5 uplands on Sunday from 11:00 a.m. to 6:00 p.m. The Brooklyn Heights Cinema will be showing The Grand Budapest Hotel and The Lunch Box. More information and showtimes are here. Bargemusic has three “Masterworks” concerts scheduled this weekend. On Friday evening at 7:00 pianist Daniel Schlosberg will perform works by Jean Henri d’Anglebert, George Enescu, and Bach, and a world premiere of Augusta Read Thomas’s “Starlight Ribbons.” On Saturday evening at 7:00 pianist Ran Dank will play works by Beethoven and Rachmaninoff. Sunday afternoon’s concert, starting at 4:00, will feature works by Schubert, Mendelssohn, and Rachmaninoff performed by pianists Misha and Cipa Dichter, violinist Mark Peskanov, and cellist Julian Schwarz. There’s more information and buy tickets here. Saturday afternoon at 3:00 there will be a free, family oriented “Music in Motion” concert. Doors open at 2:30; first come, first seated. Looking ahead to Monday, May 5, from 6:30 to 9:00 p.m., the Brooklyn Historical Society will present a trivia event geared for bike enthusiasts, “Spinning wheels: Pedal Powered Trivia with the Trivia Masters.” There are prized, and plenty of Brooklyn Brewery beer. Admission is $15, or $10 for BHS members; reserve tickets here. On Wednesday evening, May 7, starting at 6:30, BHS will host another of its “Brooklyn on Brooklyn” discussions, this on featuring choreographer Elizabeth Streb and real estate developer Jed Walentas of Two Trees Management. BHS says: “Expect an evening of unvarnished talk about art, real estate, and an ever-changing Brooklyn.” Admission is $5; free for BHS members. Reserve tickets here. Wow. It Was fantastic. That goes for the music, the choir, the 3 soloists, the pianists, the percussionists, and not least of all, the composer and lyricist.